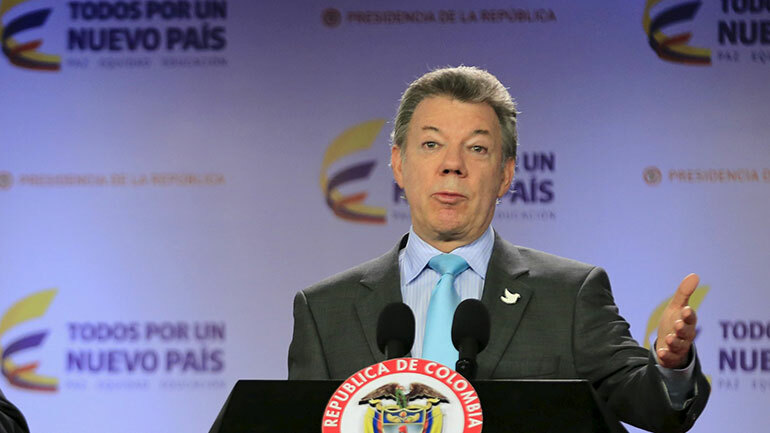 Three years after the peace talks with the FARC began, President Juan Manuel Santos implied that he would have to resign if the Colombian people reject an eventual peace deal. Thursday marks three years since the official start of the talks in Havana, Cuba. They have taken longer than expected but many things have been achieved and the negotiations are due to conclude on 23 March 2016. However, there is some fear that they could still fail altogether if and when the agreed deal is put to a plebiscite. If the Colombian people fail to vote in favor of the deal, the efforts of the last three years will be for nothing. For much of Santos’ presidential term the peace talks with the FARC have been the focus and he has been vocal about his hopes of being the president to bring Colombia to peace. Among current unrest at the negotiation table about the method for the ratification for the peace deal Santos said in an interview with the BBC that he “will be in serious difficulty” politically if the Colombian people reject the peace deal in the plebiscite. Humberto de la Calle, the government’s chief negotiator, urged the FARC to quickly resolve the pending issues, such as the bilateral ceasefire and justice, during a speech made from Havana, Cuba on Thursday, the third anniversary of the process.